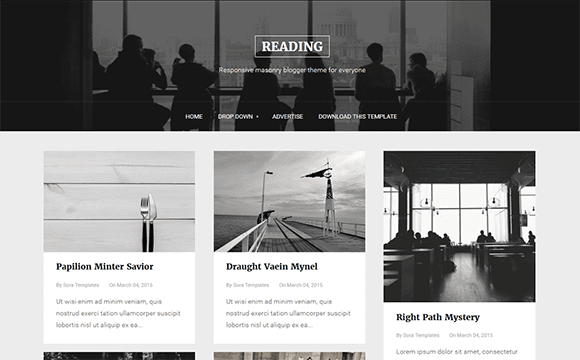 Reading is the perfect blogger template for personal blogs and fashion blogs, It is completely responsive and perfectly optimized for better SEO and fast loading, It has grid layout with fluid responsive display allowing your readers complete convenience while reading your blog posts. Reading is equipped with various of widgets which will help you to publish your blog more professionally. To make it easy for you we have published this detailed documentation, so that you can setup your blog correctly. You have made a good decision by choosing our template. You can check the live demo or download the template through the button below and also Please Read this documentation carefully in order to set up your blog and please note that there’s no support for free users. How to remove the default black photo on the blooger home page ? We have updated the documentation, please check it again. How do I change the thumb img "https://lh4.googleusercontent.com/-G9M2DTCTUwM/Tlh-2pwtc5I/AAAAAAAABKM/kCJg-Kf3W2M/no_image_yet.jpg" on the blogger home page? I can't search this item in template. Is it premium version, if I wanna change it? It only appears when your post doesn't have any image. I am having trouble finding the code to change the top background image. I have reading premium. Also, seems to be some problems with the border surrounding the title of my blog. Try searching with smaller piece of code, instead using whole code. Hi, I've looked all through the code and the documentation and can't for the life of me find how to change the background image? Please help? It comes under premium service. The main page is showing only 2 posts even though I set it to 6 posts. And this happen after I create / update a total of 30 posts on my blog.